PHOTO: Captain Dragan Vasiljkovic (aka: Daniel Snedden). There is a strong evidence that ''Vasiljkovic operated with his paramilitary death squads in eastern Bosnia until at least 1994''." An Australian judge has found in a civil case that Serbian fugitive Captain Dragan Vasiljkovic (also known as Daniel Snedden) sought for extradition by Croatia over his wartime actions in the 1990s committed war crimes. 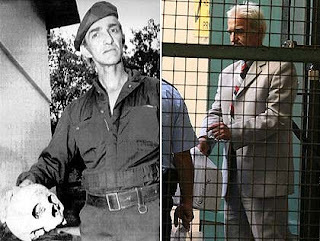 NSW Supreme Court judge Megan Latham said that evidence of ''truthful and reliable witnesses'' had established that Dragan Vasiljkovic (Daniel Snedden) ''committed torture and the war crime of torture''. The judge also accepted that a Bosnian woman from Zvornik who testified in the Sydney court had correctly identified Vasiljkovic as the person who repeatedly raped her. Zvornik is located in the Srebrenica region (two municipalities are just several miles apart). 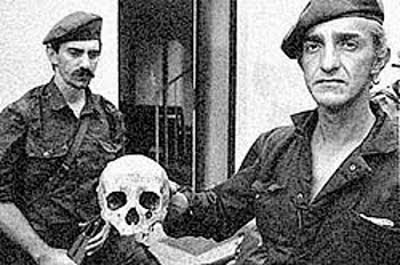 Captain Dragan was a founder and leader of the extremist Serbian paramilitary unit called the Knindže. The unit operated in the forcibly occupied Croatian territories of now defunct "Republic of Serbian Krajina" (RSK). The unit, originally founded by the Serbian Secret Security, also engaged in attacks on the Bosnian enclave of Bihac. After the Srebrenica genocide, there were concerns over the recurrence of the massacre in the Bihac pocket area, where the population of Bosniaks was four times larger than in Srebrenica and which was surrounded and under attack by Bosnian Serb and Croatian Serb forces. In the "Operation Storm", the joint forces of the Croatian Army and the Army of the Republic of Bosnia-Herzegovina took control of the so called Republic of Serbian Krajina and broke the siege of Bihac pocket. Despite the attempts by the Croatian Government to extradite Vasiljkovic for prosecution and despite the judge's verdict against him, Vasiljkovic is still a free man - enjoying his life in the community (at least for now). ''Bosnia's court dealing with war crimes is staffed with international judges and prosecutors and it has received very high marks on the international level for its professionalism and impartiality. As a result, I plan to work with Australian and Croatian authorities to collect evidence for forwarding to Bosnian prosecutors with hope that they will bring charges against Vasiljkovic and request his extradition to Bosnia. Bosnia's court dealing with war crimes is staffed with international judges and prosecutors and it has received very high marks on the international level for its professionalism and impartiality." PROSECUTORS, BE CAREFUL TO USE CORRECT FIGURES!